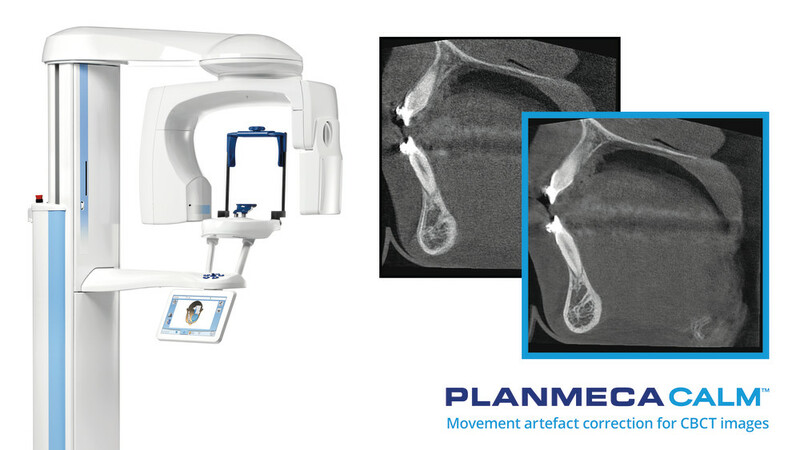 Planmeca Ultra Low Dose™ is the best method for acquiring CBCT images at low doses. The protocol can be used with all voxel sizes and in all imaging modes and allows clinicians to gather more information than from standard 2D panoramic images at an equivalent or even lower dose. All this is possible without a statistical reduction in image quality*. Whereas Planmeca Ultra Low Dose protects patients from unnecessarily high doses, the new Planmeca CALM™ imaging protocol helps avoid retakes by compensating for movement. According to studies**, patient movement can occur in up to 40% of cases, meaning that image quality is not optimal in a significant portion of CBCT scans. Planmeca CALM corrects artefacts caused by movement, resulting in sharper final images. The algorithm can be applied after a scan is complete, but also already before the exposure. When purchasing a new CBCT unit, be sure to exercise your right to receive all valid information on a product. Always ask for accurate info on patient doses and compare the differences in image quality between standard and low dose images, as well as images with and without artefact correction. The right choice will lead to improved diagnostics, saved time, reduced costs and lower patient doses. Planmeca CALM – Revolutionary algorithm for patient movement correction from Planmeca Group on Vimeo. * Ludlow and Koivisto: “Dosimetry of Orthodontic Diagnostic FOVs Using Low Dose CBCT protocol”. ** Spin-Neto and Wenzel: “Patient movement and motion artefacts in cone beam computed tomography of the dentomaxillofacial region: a systematic literature review”. Our new Planmeca CALM algorithm for correcting patient movement in CBCT images is taking dentistry by storm. As the first end-user solution for motion artefact correction from a dental manufacturer, the feature has been praised by dentists out in the field. 3D Imaging Specialist Mikko Lilja recounts how the ground-breaking algorithm came to be and why he believes every dentist can benefit from it.